Cruise ship – this is what often what one thinks about before going on vacation, thoughts wander to taking a cruise — or maybe to going to San Diego. For some people, it stops right there. Why don’t we go for a cruise from San Diego? After all, we could go on a cruise and visit San Diego too. It sounds perfect! In reading about cruises, we find out that in spite of horror stories about accidents, being stranded and illness that according to CNN Money, business is booming for major cruise companies. Last week the stock prices for some of the cruise lines such as Royal Caribbean, Norwegian, and Carnival increased to new highs and are predicted to increase even more this year and next. Much of the increases are due to the big drop in oil prices. The industry is also benefiting from more consumers and more spending on the ships once the passengers are on board. Apparently the consumers are also benefiting from money-saving gasoline bills and have more money to spend. So, let’s get back to San Diego. In spite of the cruise companies doing so much better, and a new terminal, business here has dropped for the last few years. According to the San Diego Union-Tribune, the business decreased due to the negative publicity regarding Mexico’s reputation. Since the 2007-2008 season the number of passengers has dropped dramatically. The 2015-2016 cruise ship season has 65 ships scheduled to be in port compared to last season’s 70. 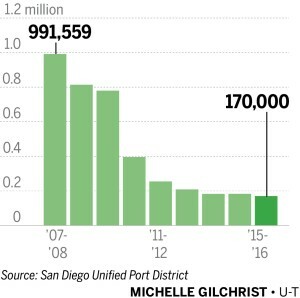 There may be more ships in San Diego as the season progresses. Ships travel from San Diego to other ports in California, South America, Hawaii, and the Panama Canal. However, the travel to Mexico is a major destination. The outlook appears to be good as several of the companies have predicted improvement in the future and have scheduled more cruises for next season. Please see the Port of San Diego website for cruise ship information, parking information, and contact information. The Cruise Port Insider contains information needed when vacationing in San Diego. It is especially valuable before travelling because it has information, maps, banking, weather, and internet access. So, when you schedule your San Diego cruise, you can find your information here.